Collingswood Rec Soccer program provides an opportunity for all kids to have fun playing the game of soccer. Recreational soccer is primarily devoted to the enjoyment and development of soccer players without the emphasis on high-level competition. The Collingswood Rec Soccer program encourages and promotes physical fitness, sportsmanship, mental stimulation, and physical development for the youth in our community through an active, organized, and a cost-effective soccer program. 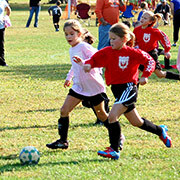 Every fall we have hundreds of boys and girls enjoying soccer in Knight Park. Our season consists of 8 games that are all played on Saturday mornings in Knight Park beginning in early September and ending in early November plus special events. We need parent coaches to make our program work. Parent coaches do not require any experience. We will provide a practice format to follow and support from more experienced coaches. We also need volunteers to help with the snack stand, referees, and other jobs required to keep the program running. Community involvement is extremely important to keep the Collingswood Rec Soccer Program going strong. There is no fundraising involved with the rec soccer program. The budget is allocated from the town administrators each year taken from the registration fee of $40.00 per player. Our number one goal is to provide a great soccer experience for every child!